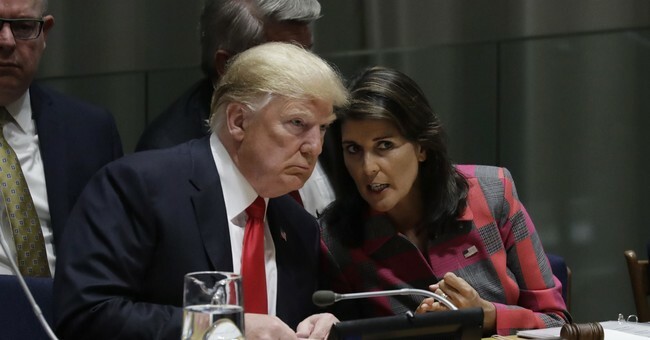 Nikki Haley's Abrupt Resignation: Why Now? (1) She's fundamentally opposed to the foreign policy direction the administration is taking, and is resigning in protest. This strikes me as unlikely. (2) She's got an ethics problem coming, and she wants to get out in front of it. Maybe, but the flights stuff seems pretty thin. (3) She's planning to challenge Trump in a 2020 primary, or that she was going to be outed as the "anonymous" op/ed writer. I'd put both in the highly unlikely category. Trump sounds like he's going to give her a strong send-off, after all. (See update). (4) Sen. Lindsey Graham is about to become Attorney General, and she's ready to step in to fill that Senate vacancy (Graham has denied interest in this). (5) She's just tired of the position and the related attacks, and wants a break from politics and public service while her children are still a certain age. He says she mentioned to him six months ago that she wanted to depart admin at the end of the year. Haley: “There are no personal reasons [for the departure]...I’ve given everything I’ve got.” She says government officials need to know when to step aside & suggests (a) she’s drained and (b) she’s *not* permanently exiting the political stage. - With an *enhanced* reputation.